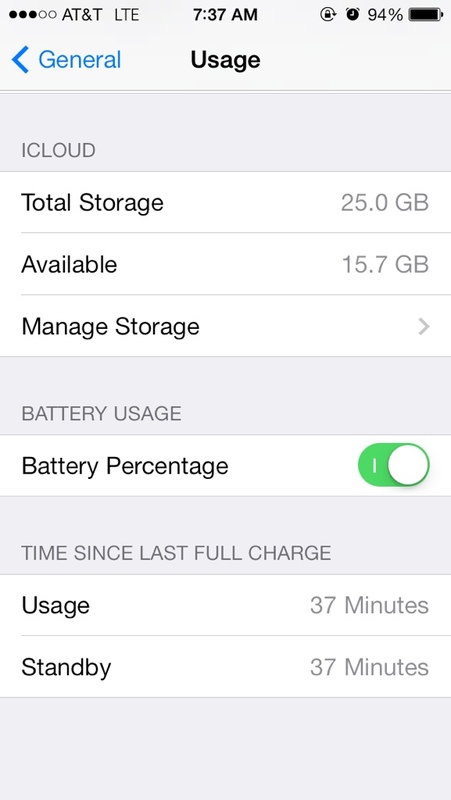 Anyone running iOS 7 will tell you battery life is worse than iOS6. Well of course it is there are more animations and functions that take a roll on the battery life. However ask someone running it how much worse someone could say “I only get 2 hours of battery now” where others would say “I get almost the same only a half an hour off.” There is a very distinct reason for this and it’s called “Ghost” usage. Now what is basically when running iOS 7 apps actually run and sometimes update in the background which is real multitasking. Sometimes (yes I realize this is a BETA but it has been 1-6 now) the app will get stuck running in the background always being used by the phones software even when you restart or RAM flush. There is no way to tell what is running in the background but you can tell something is by going to usage settings and Usage and Standby will be the exact same time. Now I have experienced it for the first time and I can’t get rid of it without a full restore. However what I think sets it off is when you make an alarm and set it to go off on weekdays or more than once I started getting ghost usage. Even turning the alarms off now doesn’t work and that is the only change I have made sense running 7 which I have been sense the release. Apple needs to fix this problem but so far they haven’t even explained anything to us or fixed the problem itself. However I wanted to let anyone know who’s running iOS 7 that this could be a cause of your battery being dead. If you’re having ghost usage then check your alarms for one that repeats. Hope this helps.